It might seem strange to combine these two destinations (mountains & jungle) but sometimes nature has its own view on your travel schedule. The easiest way to start your Everest trekking is flying to Lukla. The other option is a 2-hour bus ride to Jiri, followed by a 6-day hike. Knowing that we have the quite ambitious plan of doing the 20-day Three Passes trek, another 6 days of walking seemed a bit too optimistic for our not so well trained muscles (and mind) . So off to Lukla! Arriving at Kathmandu’s small domestic airport immediately set our hopes straight: a sign on the check-in counter ‘Delay due to bad weather in Lukla’ and a bunch of other travellers sitting on their luggage, on the floor, or just wherever there was a small place left. We soon found out that this was not so uncommon as a Swiss & German guy we met were already waiting for their third day in a row. Let’s say that they were ‘habitués’ to the process, so after a few hours waiting (around 10.30 am), we rebooked our ticket to the day after and left the airport, as the airline company only cancels the flight after 3pm (Usually the weather in Lukla only gets worse instead of better, so there was no real use in waiting any longer). We spend the afternoon in the cosy hostel of these guys and we learnt a lot about their expedition. They were not unexperienced hikers like us, since they were going to climb 3 peaks in the Everest region. Lukla is the most dangerous airport in the world as it lies at a height of 2859m, surrounded by mountains and it has a very short landing strip (450m). The strip even inclines a bit, so planes are slowed down when landing and get an extra push when taking off. It is necessary that weather conditions are optimal to land here: this means good weather in Kathmandu, good weather in Lukla & good weather on the way. With new hopes we arrived at the airport: no delay sign, not a trace of our friends (who were scheduled on the 1st plane, we on the 3rd plane) and we could even check in our luggage. This looked great! We passed the security control, just a little more waiting and off we went. We were excited as we got on the bus that would bring us to the plane, smiling at each other that this was our lucky day. But our luck was soon over when we were asked to get off the bus and re-enter the airport terminal… damned, we were so close . Lukla’s airport was closed again. As we already passed the security control and our luggage was checked in, we had to wait ‘till 3pm before we could return to our guesthouse in Kathmandu. One good thing, on our way back some Swiss girls learned us that the taxi price was much lower than what we paid before, so our minds were set on bargaining the next day! The flight to Lukla only takes 40 minutes. But still, it happens to people that they are already in the air when the airport closes so the plane has to return to Kathmandu. We were close, but still not that close . Third time’s the charm! But exceptions prove the rule, I guess, because again a delay sign and familiar faces that we recognized from the day before. We made an agreement with the manager from our guesthouse (who booked the plane tickets) that we only needed to wait until 11am, and afterwards we could return ‘home’ and schedule our flight on a new day. We continued our day of sitting and waiting, with 2 local bus rides and a taxi jeep to reach Chitwan after dark (7pm). The first & longest local bus ride was again crazy with a driver that thought he was a F1 pilot or something… but he wasn’t… as our heads regularly bumped the bus’s roof. Nepali bus drivers never give up. They- again- tried to charge us 500 roepies (a bit less than 5€) for a bus ride that costed 60 roepies. We only had 1000 roepies and needed to ‘block’ the bus until they have given us the appropriate amount of change: first 500 roepies back, then another 100, and another, … until we finally got all our change. Our guesthouse was the nicest & cleanest until now. We even had a sink & a shower that we would consider in our own house . Unfortunately, it seems that Lattoflex did not yet reach Nepal and believe us, that would feel good after 3 weeks of hard wooden beds and long & bumpy local bus rides. But what about Chitwan national park? Chitwan is famous for its wildflie: Rhinoceros (>400), crocodiles, tigers (>100), deer, sloth bears, monkeys, … Of course we were hoping to catch a glimpse of them, even if we were there off-season. Chitwan is also famous for its elephants rides, unfortunately. We decided not to this as we do not support this. However, we started our first day at the river to see how they wash the elephants. Although it was quite fun to watch, it is really difficult to form an opinion on how the animals are treated. 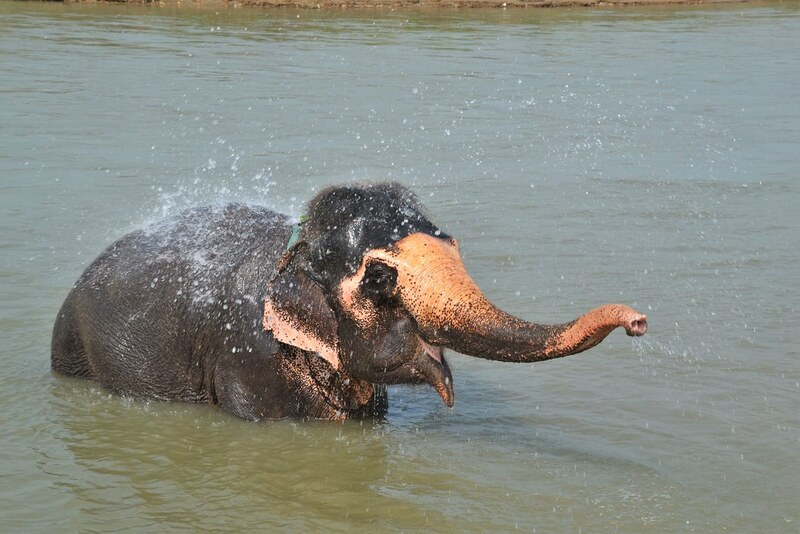 It seemed like the elephants were enjoying their bath, but still they are kept in captivity and during the day they have to work a lot and are not free. The elephants that you see during the bathing are all privately owned elephants and they are only used to make money out of it. 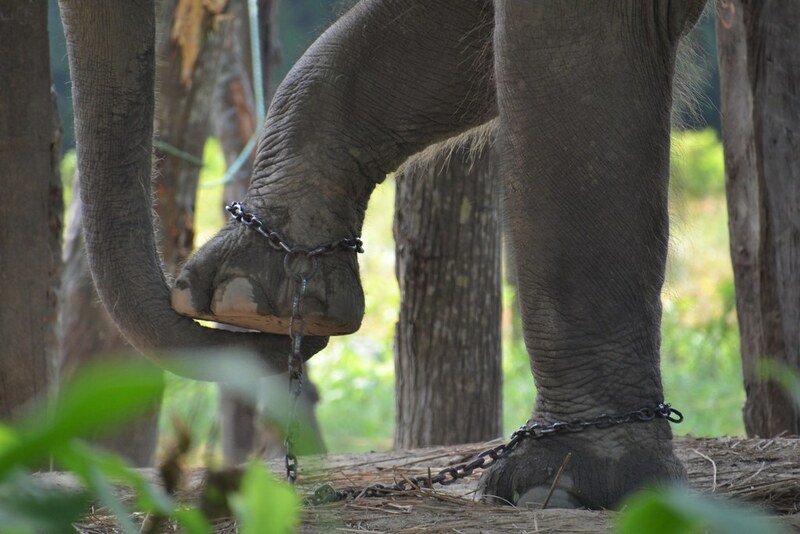 Later that day, we also saw how some of them are kept at home: just a roof where they barely fit under and chained to 3 legs. And this elephant was there all day… it was sad to see and it confirmed our decision not to go on an elephant safari (even if that increases your chances of seeing other animals). In the afternoon, we went to the elephant breeding centre where we saw baby elephants of all sizes and their mothers. Again, elephants in captivity but we had a better feeling about this. They are owned by the government and trained/used for better purposes: patrolling in the national park (wildlife conservation, finding poachers, …), reaching injured animals, guiding wild elephants/rhinos from the village back to the jungle, … They are mostly kept out of leg chains, but are kept in a zone with an electrical fence. During the day, they take them out grazing and bathing in the jungle. Each elephant at the breeding centre has 3 mahouts (trainers) to whom the elephant listens (in case one of them gets sick or has a holiday). Just before dark, at the river that separates the village from the national park, we saw 2 rhinos crossing the river: one quite far but the other was just at the other side. Our first wildlife! Hoping to see many more the day after, when we booked a 1 hour canoe tour, followed by a day hike in the jungle. At 6am, the day started with a peaceful boat ride, a canoe made from 1 single tree, where we saw more wildlife on the river banks: crocodiles (including human eating ones), many deer (bambi’s :-)), peacocks, kingfishers & many other birds (but as we do not know the Dutch names, it is difficult to remember the English ones). Benjamin was really excited for the jungle walk, but I warned him that we would definitely walk on a fixed trail and that he would not need a machete to cross the jungle. As the canoe stopped at some very tall grass where we would start our jungle walk, it seemed I was wrong . The whole day long, we walked barely on trails and really had a fantastic jungle experience. This was the benefit of visiting Chitwan national park off-season: the grassland is very high (higher than elephant size, and believe us, elephants are very big once you stand next to them) and there are almost no tourists. We did not see any tourist whole day long. The downside is that you also don’t see many animals as the grass is so long. However, because you know they are there, you have a continuously increased level of arousal which made it a very excited day. Thoughts like ‘Would that be a good tree to climb in if we encounter a rhino?’, ‘Where will I run to if a tiger pops out of the grass?’, ‘I see something orange, oh my god, is that a Tiger? Ah no… It is some deer’ or ‘Should I drop my backpack so I can run faster if I am in danger?’ crossed my mind during the walk. 1 month ago a 28-year old woman from the village was killed by a tiger when she was cutting grass. That same tiger already made 8 deadly victims before they caught it. Note: capturing this animal could only be done when the tiger was out of the borders of the national park, within the borders it is forbidden to catch animals. Probably, he will end up in a zoo as they say that a tiger, once it has tasted human flesh, will hunt for humans over and over again. As we eat salty, we taste more salty than other creatures, a taste that tigers seems to like. But (luckily or unfortunately) no tigers for us! We did see many deer, some monkeys (macaques, the same that we saw at the monkey temple in Kathmandu, but now in the wild and not trying to grab our leg or our plastic bottle), birds, traces of tigers, traces of rhinos, … but the highlight of the day was definitely when we were sitting on a watching tower, taking a rest, eating some rice out of a plastic bag (leftovers from our lunch package), arousal level back to normal, when suddenly a rhino popped out of the long grass (literally out of nowhere, what made our arousal level even increasing when we continued our walk later on) straight in the direction of the viewing tower. We had such great views on this impressive animal while it passed the tower, grazing, at ease. It was so close, but we were so safe in our tower, all silently, not moving, in order not to chase it away. 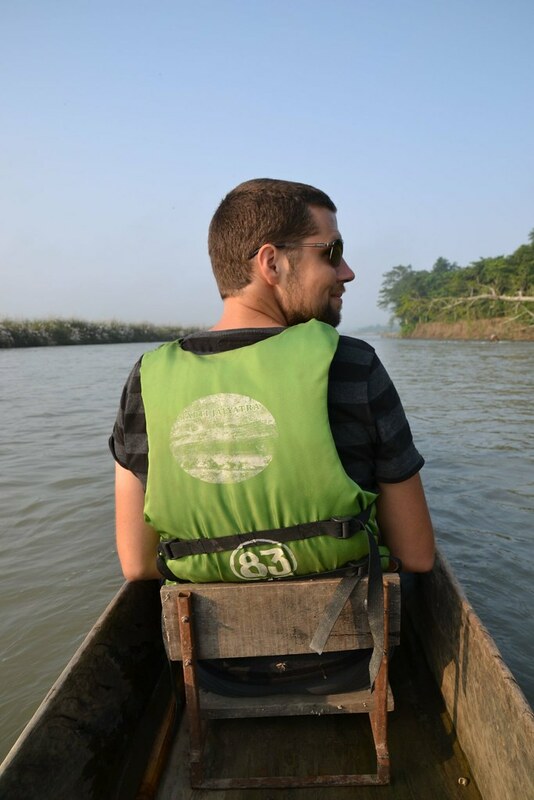 For safety reasons you need to be accompanied by 2 guides in Chitwan National Park. One was walking before us, the other one behind us. Even if you are alone, 2 guides will accompany you. If you are a group of 4, you need 3 guides, one in the middle. They are only allowed to carry a stick, no arms. At 6pm, we returned from the jungle (it gets dark then), bought our guides a drink in order to thank them for the day and at 8pm we could not hold it any longer: lights out and time to sleep. Guess that’s what a day of jungle does . Today we headed back to Kathmandu, for the first time since our stay here with a tourist bus: comparable with a bus back home, but as the roads are not like in Belgium it remains long & bumpy. But at least the driver knows that he is not a F1 pilot. And not everybody is staring at you. And there is WiFi and airconditioning. Oh no wait… that is just written on the bus in order to justify the higher ticket price . Elk nadeel heb zn voordeel, superblogje en supere foto’s (again). Big fan here! XOXO right back at ya.